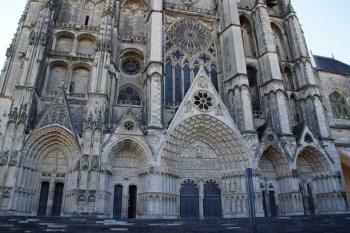 Bourges Cathedral is considered a masterpiece of Gothic architecture, with beautiful decoration. Its construction began at the end of the 12th century, following the plan of the ambitious archbishop Henri de Sully who had brought "modern" ideas from Paris. He wanted to create a large and tall building, with three rows of stained-glass windows above each other so that there was a lot of light. The cathedral is also a symbol of the power of Christianity in medieval France. Bourges Cathedral was meant to be my 650th visited WHS – but after my biggest WH travel mistake ever I had to rearrange my 5-day trip to south-central France. I had planned to visit my last 4 remaining WHS on the French mainland plus 1 TWHS within that time-frame. The route involved quite a bit of driving, but it would all still be doable. My chances turned instantly when I discovered at the car rental counter of Clermont-Ferrand airport that I had left my driver’s license at home. No license = no rental car = no remote WHS visits. The Vézère Valley and the Pont d’Arc Cave would have to wait, and even reaching Saint-Savin sur Gartempe now would involve a minor expedition. So I eventually ended up on a train from Clermont-Ferrand to Bourges. This area of France is not well-covered by public transport, and I had to wait a few hours to take the first train north. I arrived in the mid-sized city of Bourges in the early evening. The streets in the town centre were deserted, and the inhabitants seemed to be in some kind of voluntary lock-down: no lights visible from the streets, gates and shutters closed. After dropping off my luggage at the hotel, I went directly to the cathedral for a first look. It was beautifully lit. The next morning I did a proper cathedral visit. I started with its exterior. You cannot fully circle it, but at the north and east wing there are two chapels that are worth a look for their sculpted decorations. The best decorations however are at the front (the western entrance). Its 5 portals are framed with all kinds of biblical and regional-historical scenes. These 5 entrances are in itself one of the special things of this cathedral: a 'normal' gothic cathedral of that period has only 3. I especially liked the heaven versus hell scene above the main door. Hell is portrayed particularly nasty, with little devils pushing unfortunate human beings into a flame-spewing mouth. The cathedral’s interior already is open from 9 a.m., and entrance is free. Only the tower and crypt have more limited opening hours (French office hours with a long lunch break) and require a fee. I wasn’t keen on climbing the tower, and the crypt was closed for the morning due to a private function. So I just ‘did’ the main cathedral. Right near the entrance stands an historical astronomical clock. It still ticks and chimes nicely. The stained-glass windows however are the main attraction. The cathedral has 3 rows of windows above each other, and all those windows are painted. At the back, in the choir, the oldest windows can be found. These are the 13th century originals. They let through little light and are mostly done in red and blue. The ‘newer’ (still as early as the 15th century) stained glass windows are lighter in colour and more translucent. Despite all these windows I found the cathedral still quite dark inside. The original 1992 site description mentions that the designated area also includes “… a 13th century tithe barn, those elements of the 17th century Bishop’s Palace which survive as the Hotel de Ville, and the cathedral gardens in classical French style.” However this is not reflected in the official map, where the core zone only consists of the cathedral. As these additional elements are situated next to the cathedral I had a look at them anyway. The gardens are a good spot to take photos of the cathedral building as a whole – very hard to do otherwise. And the tithe barn is an interesting timber-framed storage or granary. In the Middle Ages it was used to store the church tributary (one-tenth of a farmers produce). Bourges was the first of five Gothic cathedrals on the WH list, that we visited on our trip to Northern France in August/September 2015. The others were Chartres, Reims, Amiens, and Paris. Definitely an overrepresented category. But each of them has its special characteristics and it is difficult to decide which is the best and most impressive. The special architectural feature in Bourges is the floor plan without a transept. The five naves extend without interruption along the entire length of the Cathedral. The effect is a very harmonious and uniform interior, the view along the nave seems to be endless. The homogeneity of the architecture also applies to the exterior. In the side view, the pyramid-like construction with the different heights of the naves is clearly visible. The minus is the west façade, the face of a cathedral. The massive and chunky towers do not really fit to the fine sculptures of the portals. The façade cannot compete in elegance and harmony with other Gothic cathedrals. Moreover, the façade is poorly visible, there is no large square in front of the west portal, the surrounding buildings are very close. The photo is taken from the best possible angle, but I had to stand with my back to the wall. We visited Bourges on a Sunday morning, when the crypt and the tower are closed. However, I don't think we missed a lot, the town was not so impressive that the view from above seemed very tempting. And there are 400 steps to climb. All in all, the Bourges Cathedral is an impressive building, especially the atmospheric interior, but I would not rank it among the top three Gothic cathedrals. Over 50 years ago, my husband and I were driving through France on our honeymoon. Our guidebook recommended seeing Bourges cathedral. And so, we stopped. It was a sunny mid-morning in August, and when we opened the doors, the cathedral appeared to be empty. Upon looking closer, we saw there was a casket in the middle aisle in front of the main altar and several black-shawled women in the front pews. Suddenly, chant began for the Mass of the Dead. We did not wish to intrude with sight-seeing on such a solemn occasion, so we found our way up somewhere in the choir lofts. And we marveled at the beauty of the occasion which was completely unexpected. This was why these cathedrals were constructed. The chant of Dies irae dies illa filled the church, the incense slowly wafted upwards to the lofts, the sun majestically dressed the church with multi-colored lights from its windows. And I started to weep silently at the glory of such a blessing and then to have shared it with the unknown, bereaved family. It is a memory that is forever green. I visited this WHS in May 2013. The stained glass alone is worth the trip and the WH status! I was positively surprised especially since I thought Chartres' stained glass had no rival. The astronomical clock inside this gothic cathedral is also a highlight and signs claim that it is the oldest one in France. There was almost no reason to visit Bourges, since the city was quite off the beaten track for normal tourists and the nearby Loire Valley was far more attractive; however, this city had a UNESCO world Heritage site and it was the sole reason to bring me here to admire the beautiful Cathedral of Saint Etienne. When my train approached to Bourges, I could saw the Cathedral dominating the city skyline like I had seen at Chartres, but when I was in the city itself; surprisingly quite hard to find this big cathedral since it was well hidden behind the rows of old buildings, really easy to bypass this giant without notice it at all! The cathedral was really beautiful, its stained glass windows, vaults, pillars were just all amazing, a real masterpiece, truly one of the great cathedral. Not only was the Cathedral, its formal French garden also lovely and very photogenic. If Bourges Cathedral was in other country, this place must really be a great tourist attraction, but France was a country with load of beautiful Gothic cathedrals and if seeing Notre-Dame or Saint Chapelle in Paris or the one in Chartres and Amiens or even Strasbourg before, all were WHS, those places definitely made Bourges to be just another nice cathedral for visitors’ opinion. 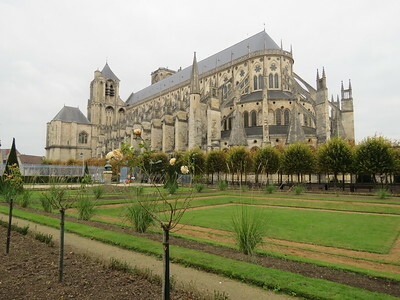 Since Bourges Cathedral was really beautiful, but this was my sixth WHS Gothic Cathedral I saw in France, I believed this was too much for just one country and all were Gothic! Also these really made me wonder how many more Gothic cathedral I have to visit if I want to “complete” this country and this really made me bored and questioned what the unique of these cathedrals was since I was unable to see it clearly. As far as medieval, Gothic cathedrals are concerned, the one at Bourges (St-Etienne) is definitely one of the best, and located as it is in the very pretty town of Bourges, makes a trip there worthwhile, but how many cathedrals should be on the List is a different story...not that many more, I would say. Since Bourges was an important stopover point on the way to Santiago, the cathedral is additionally inscribed on the WH List as part of the "Routes of Santiago de Compostela in France" and gives you two WH sites for a single visit...not too bad, either. In our trip to France we have been to the town of Bourges to visit the impressive Cathedral of St. Stephen, a stunning Gothic masterpiece. In the 3rd century there was yet a Christian cult centre in the Roman city of Avaricum, the first Christian community in the Gaul. In the 11th century was constructed a Romanesque church, of which survives a small crypt beneath the present building. In the 12th century were added transepts and the façade but, after some fires, the building was entirely rebuilt from 1195 to 1260; it was also one of the stops on the pilgrimage to Santiago de Compostela. The façade with high pillars has asymmetric towers: one was built in the 16th century, the other, lower and supported by a pillar, in the 13th century. The portals have tympanums and spires with stunning sculptures and relieves, also representing the Last Judgement. On the sides, that are supported by high buttresses, are two Romanesque portals with sculptures, preceded by porches. The interior, supported by high pillars, has five naves with lateral chapels and a double ambulatory. The incredible stained windows, made between the 13th and the 16th century, are situated on the walls of the main nave, in the lateral chapels, in the ambulatory and its lateral chapels and in the apsidal chapels; the nicest represent apostles, saints, prophets, the Annunciation and red and blue medallions. There are also nice polychrome sculptures, an astronomical clock and two tapestries projected by Raphael. The crypt was constructed in the 12th century on the moat of the Gaul-Roman walls, has a double ambulatory supported by six pillars and contains a tomb sculpture from a big mausoleum, that has been destructed, a sculpture in polychrome stone representing the burial of Christ and fragments of a jubé. This cathedral is one of the most beautiful monuments I have ever visited because of the quality of the architecture and of the decorations. It's absolutely worth to be visited also because it's the most impressive French cathedral and justifies the inscription. It goes without saying that this cathedral is an astonishing example of medieval architecture. The 12th (?) century stained glass windows behind the altar were a great surprise to me. I have never seen such a masterful use of color and light. It was a very moving and spiritual experience to see tthese depictions of Christ in stained glass. How to read the great Cathedrals of Europe? Astronomical clocks: The Astronomical Clock of Bourges cathedral dates back to 1424 and was made by the canon and mathematician Jean Furosis. The clock is made of a tower holding two clocks, painted red and decorated with flowers, shields and golden lines.